Chef Brisson, the culinary director of Batali & Bastianich Hospitality Group in Las Vegas, oversees the fine dining served at CarneVino as well as B&B Ristorante, Otto Enoteca and more. 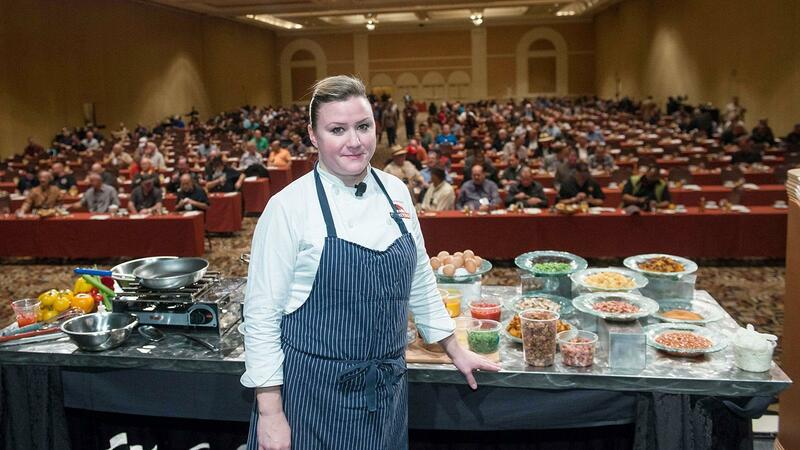 The pan sizzled as chef Nicole Brisson tossed chunked potatoes onto its surface. Soon, the smell of garlic wafted into the air. Breakfast was about to be served. Chef Brisson, the culinary director of Batali & Bastianich Hospitality Group in Las Vegas, oversees the fine dining served at CarneVino as well as B&B Ristorante, Otto Enoteca and more. She was cooking Tchoupitoulas Hash, a hearty dish named after a famed street in New Orleans. This was creole fare: hearty, rich and with just the right amount of spice, meant to wake up those taste buds that had smoked so many cigars the day before. 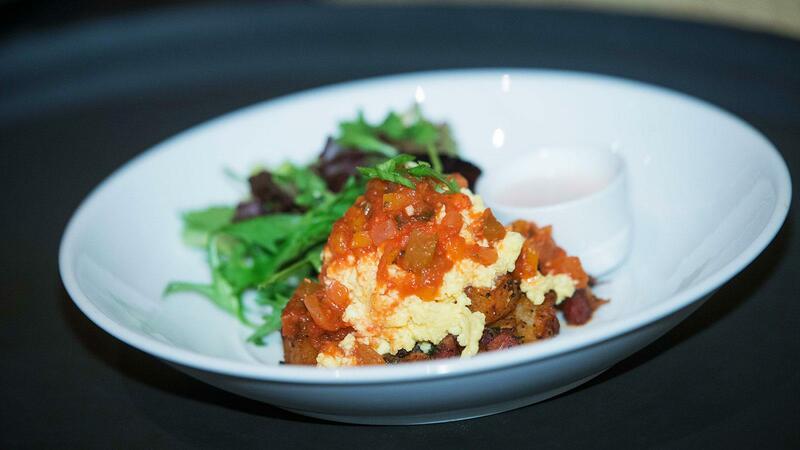 Brisson's dish of Tchoupitoulas Hash, soft scrambled eggs, creole sauce and a small salad of greens. 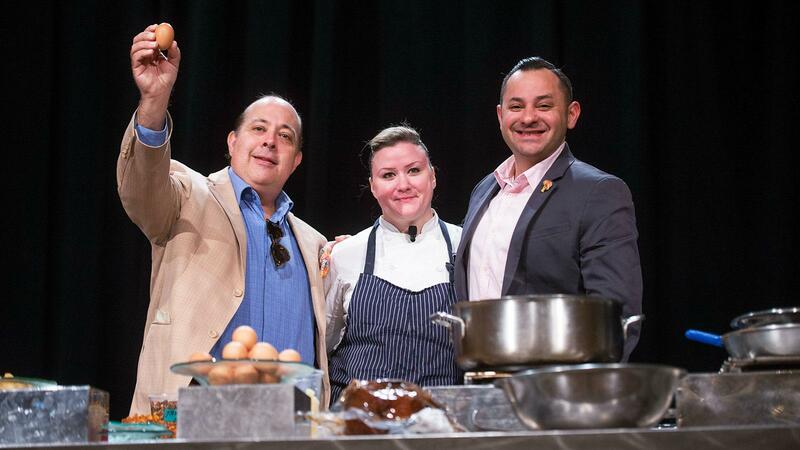 The crowd didn’t have to wait—they were served the dish, paired with soft scrambled eggs and creole sauce. On the tables were baskets of hearty pastries and muffins, and the hard-working waitstaff of the Mirage Hotel were kept busy refilling cups with much-needed coffee to wake up the room. Brisson continued with the demo. In went the Tasso Ham, a lean, spicy cured meat found in Louisiana. Brisson called it one of the most important ingredients in Cajun cooking. As the hash was cooking, Brisson turned to the eggs, giving a tip about how to scramble them best. "One of the tricks to eggs is not to start too soon," she said, cautioning the crowd to be patient with their eggs. Clay Roberts and Sam Phillips, the co-presidents of La Palina, join Brisson on stage to describe the breakfast cigar. The final dish was a masterpiece—the hash, which had just the right amount of spice and plenty of flavor—plus the soft scrambled eggs, creole sauce and a small salad of greens. (Even a cigar smoker needs the occasional vegetable.) All the ingredients played well together, the perfect palate waker upper. After the demonstration, Clay Roberts and Sam Phillips, the co-presidents of La Palina, took to the stage to describe the cigar that was going with breakfast, the La Palina Bronze Label Toro. It’s a new size, a TAA Exclusive, that shipped in May. With plenty of rich food in their bellies and caffeine in their veins, the crowd heartily applauded Brisson’s efforts. Next up, they were ready to head to the Roll Your Own seminar and light up cigars.